To create a Follow-up Task, click on the three dots at the top of the Task card, then simply select the “Create a Follow-up Task” button. This opens a window, from where you can edit the details of your Follow-up Task. To finish the Task creation, click the “Create Task” button. The new Task will open instantly if you want to add any further information, such as attachments or comments. 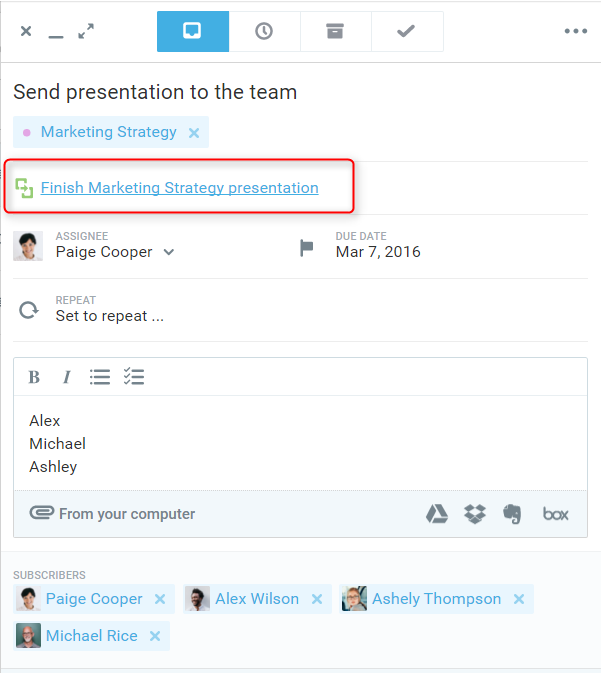 You will notice a slight difference with the new Follow-up Task you just created. There is now a direct link to the Task from which it was created, so you can jump right back to this first Task quickly if you need to refer back to previous information. This eases the back-and-forth between Tasks, saving you both time and effort. The best way to have access to the original task is to ask the person responsible to that task to give you access. You cannot delegate a Follow-up task to a guest directly upon creation, because guests do not appear as potential assignees. In order to delegate, you need to first create the Follow-up task, and then share it on the appropriate subject to be able to select the guest you want to delegate it to.